Some 1,500 tiny predatory lady beetles, Sasajiscymnus tsugae, will be released Thursday, May 5, at Vaughan Woods State Park in South Berwick in an effort to control the invasive insect, hemlock woolly adelgid. An infestation has been found at the state park along a feeder stream at the park. A hemlock tree infested with the hemlock woolly adelgid. FREEPORT, Maine — Wolfe’s Neck State Park has an unwanted visitor. It’s small, white, fluffy and likes trees, specifically hemlocks. So much so that it kills them. 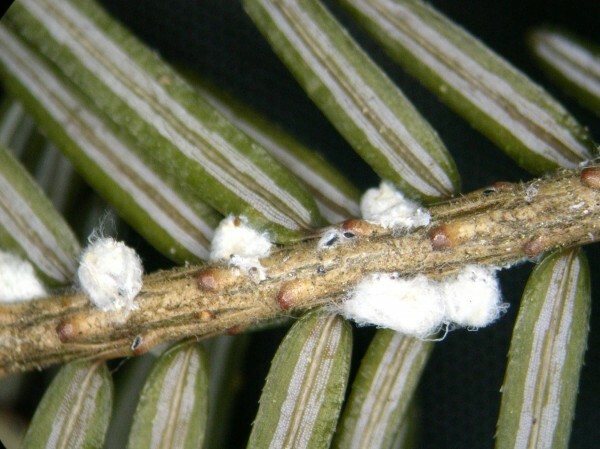 The hemlock woolly adelgid is a tiny, cotton-ball-looking insect that is attacking hemlock forests along Maine’s coast. In a move to subvert the invasive species, the Department of Agriculture, Conservation and Forestry has released 1,700 predator beetles at Wolfe’s Neck and two other state parks: Vaughan Woods in South Berwick and Ferry Beach in Saco. The small, black beetles, known as Sasajiscymus tsugae, also will be released in other areas in the state in the coming months, including Cape Elizabeth and Wiscasset. The effort will be supported by a cooperative agreement between the state and the U.S. Department of Agriculture’s Animal and Plant Health Inspection Service Plant Protection and Quarantine program. While the predator beetles have been released into specific areas, the state has to contain them and keep close tabs on where the insects are moving, department spokesman John Bott said. Managing the hemlock woolly adelgid is vital to the long-term health of hemlock trees in Maine, Bott said, noting that although it’s best to catch invasive species as soon as possible, this particular insect has already taken hold. The species injects toxic saliva while sucking sap out of the trees, causing the infested branches to dry up and the leaves to turn grayish-yellow and drop from the trees. Infested trees are more likely to succumb to diseases and wood-boring insects, which makes the weakened trees more susceptible to being toppled by strong winds, according to the department. While other methods, such as sprayed pesticides, could be used to thwart the aphidlike insect, the state believes unleashing predator beetles is the most effective way to attack them in this circumstance. The beetles come from a Pennsylvania laboratory and were purchased with money donated by park supporters, including the South Berwick Conservation Commission, and federal grants, Bott said. It’s not completely known how widespread the hemlock woolly adelgid problem is or how long it will take to manage them appropriately, he added. Invasive species, such as hemlock woolly adelgids and the much more harmful ash wood borer, seen in New Hampshire earlier this year, are often transported by people bringing in firewood or out-of-state plants into Maine gardens, nurseries or greenhouses. The hemlock woolly adelgid, originally from Japan, has been found in 18 different states, with its first Maine sighting in a Kittery forest in 2003. At Wolfe’s Neck, forestry staff first found them in 2010 as part of an annual inspection survey.